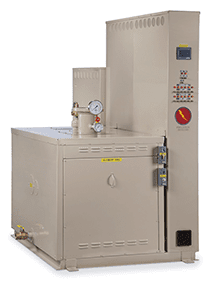 Precision hot water boilers deliver the performance and reliability that system design engineers and facility owners demand. Our standard models are designed and fabricated to strict industry standards with a complete trim package to meet a wide variety of requirements and range of applications. For unique installations, Precision offers unique solutions including more sophisticated control options and special trim components to provide a distinct customized solution. 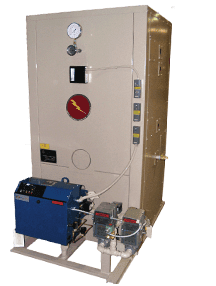 Precision offers both electric (PCW and HW series) and fuel-fired (FTH and FPH series) boiler designs. 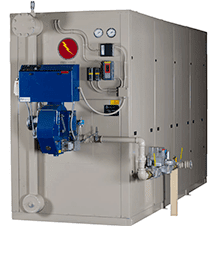 Our hot water boilers are commonly used for hydronic heating in the following applications: K-12 school buildings, college and university buildings, dorms, hospitals, office buildings, government buildings, etc. Developed specifically to fit through a 30” door, the standard PCW’s compact footprint can fit where a fuel-fired boiler cannot. 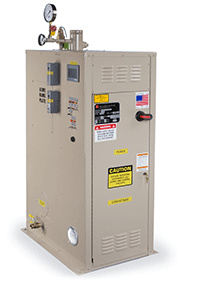 When extra options require a larger cabinet, Precision can customize the assembly to supply the boiler in a ‘knock-down’ condition to preserve the design advantages that make the PCW ideal for retrofits, or where venting a fuel fired boiler is not an option. All standard models can be supplied with optional trim and controls to enhance performance. For example, an SCR will deliver near infinite modulation for precise load following. Other options include an integral main power disconnect to meet NEC code for resistance heating equipment, and construction under ASME Section I/VIII for high temperature hot water applications. Traditional vertically configured fire-tube design with better overall efficiency due to under-fired power burner. In addition to the simplicity of the 4-piece design, the FPH includes many advantages over other vertical configured boilers. For example, its larger water volume results in both a low pressure drop thru the unit and reduced cycling, to improve overall efficiency. Flex-tube forced draft design offers high fuel-to-output efficiency in a compact, maintenance-friendly design that harnesses natural heat convection to ensure consistent internal heat distribution and complete internal water circulation. Noted for their small footprint compared to a horizontal fire-tube, the FTH accommodates up to 150oF temperature differences from the supply and return, and offers virtually instantaneous hot water. The FTH can be configured to communicate with any building management system. Other available options include construction under ASME Section I/VIII for high temperature hot water applications.